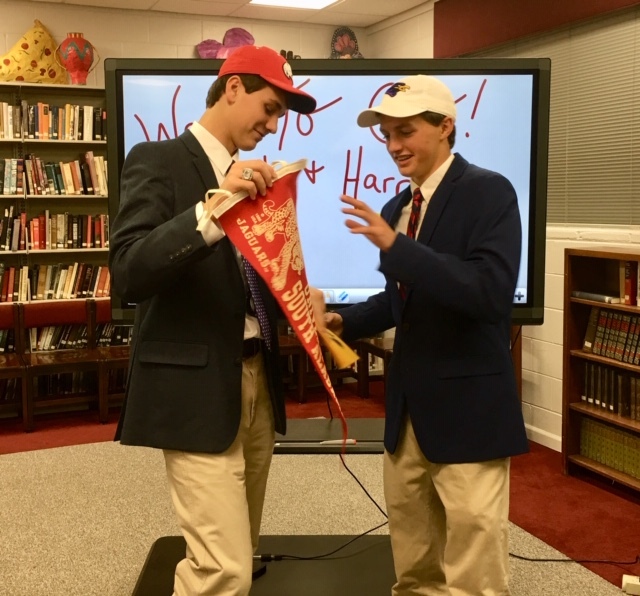 Donoho golfers Jacob LeCroy (L) and Harrison Hughston unveil their college choices at Wednesday’s signing ceremony. Jacob LeCroy is one of the most emotionally steady players you’ll find on a golf course; nothing rattles him. Need to hit an important shot late in the round from a dicey lie? No problem. Two shots back with three holes to play? Ramp up the grind. A five-footer to win with your closest challenger already in the hole with birdie? It’s good. There just aren’t many situations that cause the state champion Donoho senior to blink, but when the time came to thank everyone who made his road to a Division I golf scholarship possible, the emotion rolled out like a downhill putt from the top tier of Anniston Municipal’s No. 2 green. 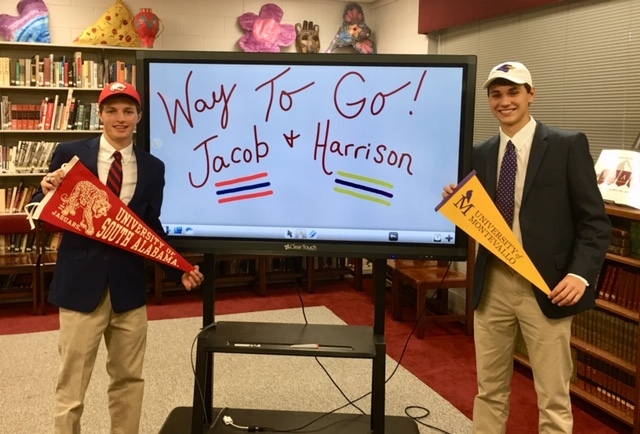 Harrison Hughston (L) and Jacob LeCroy return the goods after having fun with each other’s college material during Wednesday’s signing ceremony..
LeCroy and his county champion teammate Harrison Hughston both signed college golf scholarships Wednesday, LeCroy with South Alabama and Hughston with Montevallo. Hughston choked up a bit, too, but not to the degree of LeCroy who couldn’t get past the first few lines before passing his speech over to his best friend. It was understandable. The day represented the end of a long journey for both players and marked the beginning of another road that sets up their future in the game. “It just shows you how hard they’ve worked and how much emotion is involved in reaching a goal,” said Wayne Flint, the renowned Birmingham instructor both players credit with getting them to be college-level players. “It’s obviously been a long-term goal of his and when he sat down for that 30 seconds he realized this is it, this is what I’ve worked my whole life for. Neither player initially thought about playing college golf until they started working with Flint. He put them both in a training program and they ran with it. This summer LeCroy led the Falcons to the AHSAA Class 1A-2A state championship as low medalist, won Anniston Country Club’s Wilfred Galbraith Invitational and played in the IMG Junior World Championship at Torrey Pines for the second time. He took the late-arriving offer from South Alabama over stronger ones from Jacksonville State and Troy because he felt most comfortable there and believes the Jags give him the best chance of fulfilling his dream of getting to the next level. Hughston chose Montevallo over offers from Birmingham Southern and Jefferson State. His game really took flight after he started working with Flint in the spring. He won the Calhoun County Tournament a few months later.